The greatest Ikebana boom occurred after World War 2. 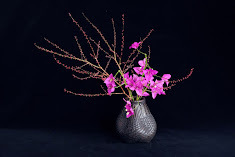 Jiyu-bana, a free style Ikebana, contributed significantly to the boom. The Juyubana movement became popular between 1926 and 1934. It lead to the New Ikebana movement, avant-garde Ikebana movement, then on to the great Ikebana boom. It was Suido Yamane who worked hard to establish Jiyubana. He was a very popular Ikebana artist at the time with many students. Because he insisted that there is no need to learn any rules in Ikebana forms, however, he was very unpopular among traditional Ikebana teachers. In one of his articles published after the war, he reported that he was “lynched” by other Ikebana teachers. Although we don’t know exactly what happened, we can assume he had a really hard time. Anyone trying to do something new inevitably has to have a difficult time in the traditional art world. However, no one has ever been as unpopular as Sofu Teshigahara, who established the Sogetus School in 1927 at the age of 27. He had a traffic accident in 1936. When this news was passed on to some Ikebana teachers who were having a party, they drank a toast for his misfortune. His unpopularity seems to be related to the fact that he later became the most significant Ikebana artist in the 20th century (Kudo,1994). In coming issues, I’ll talk more about Jiyubana and its relationship to the Ikebana boom after the war. This is one of the 12 works I exhibited at my solo exhibition at Monash University to complete my Master of Fine Art Degree. The show was a new beginning for me. Please visit my website to see a 3 min slide show of the show. Shoso has been invited to present his papers based on his Masters exegesis. Both papers will be published and will be available at some stage.